A diplomatic row has developed between France and Italy over recent months, with tensions being raised significantly by the decision of Luigi Di Maio, Italy’s Deputy Prime Minister and leader of the Five Star Movement, to meet with representatives of the French ‘Gilets Jaunes’ protest movement. Simon Toubeau explains that at the heart of the conflict lie two radically different visions of Europe. Di Maio has expressed his support for the Gilets Jaunes as they prepare to stand candidates in the European Parliament elections this year. This has caused so much trouble for the French President, Emmanuel Macron, that France has pulled its ambassador out of Rome, accusing the Italian government of making verbal attacks “without precedent since World War II”. But this gesture was merely the straw that broke the camel’s back. Tensions between the two governments – over corporate takeovers, policy towards Africa, and an exhibition of Leonardo Da Vinci’s works – have been mounting since a new populist ‘government of change’ came to power in Italy last June. This recent conflict however means that relations have soured to an unprecedented point. It is difficult to see how they can improve in the near term. It is exceptional for two of the founding members of the European Union to have such an open conflict. But it is also exceptional for Italy to have a populist government that is so hostile to the EU. This reveals that behind the diplomatic crisis lies a deeper rift over Europe. Macron’s ‘La Republique En Marche’ Movement is a newcomer on the French political scenery, but it nevertheless represents the mainstream, pro-European liberal centre. Macron poached individuals from across the moderate left and right of the political spectrum to form his new government. In France, the forces of the populist left (‘La France Insoumise’) and right (‘Rassemblement National’) are in opposition. But, in Italy the equivalent forces – the Five Star Movement and the League – are in government, while the mainstream pro-European centre is in opposition. This orientation has a direct effect on the French and Italian governments’ ‘vision’ of the EU. Macron outlined his ambitious vision of deeper cooperation in foreign, military and economic affairs in his Sorbonne speech last September. This materialised in January, albeit more modestly, in the Aachen Treaty co-signed with Angela Merkel. In contrast, the League and the Five Star Movement are more comfortable with fellow populist and Eurosceptic governments in Austria, Poland and Hungary. Both governments need to give some credibility to these contrasting ‘visions’ because elections to the European Parliament are now in sight. They have already given voters a flavour of the forthcoming campaign, which will highlight the divisions that exist across Europe about the basic nature, purpose, and future direction of the EU. The frequent attacks levelled against the French government by the Italian government are thus indirect attacks against its pro-EU integration agenda and against the EU itself. The populist parties in the Italian government will however be running against each other on separate platforms during these elections. So, they are now also cultivating potential allies in the European Parliament. The League is already a member of the ‘Europe of Nations and Freedom’, a right-wing parliamentary group that also includes the ‘Rassemblement National’. But the Five Star Movement has yet to find a suitable political home and so is seeking to embolden movements elsewhere, such as the Gilets Jaunes, that contain populist elements of both left and right. Take the case of economic policy. Macron is trying to implement a very ambitious programme of economic reforms, which has felled more than one government since these were first attempted by centre-right governments in the 1990s. Most of this is consistent with a liberal programme of structural adjustment, that is meant to solve the deep-seated problem of employment, improve the competitiveness of the French economy and maintain sound fiscal balances. This programme is vocally applauded by the EU, and especially the Commission’s President Jean-Claude Juncker. But it is controversial at home. 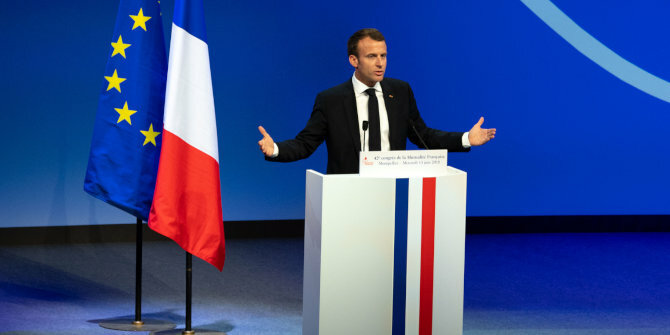 On certain aspects of the reform programme, such as education reform, labour market reform, or salaries and pensions for train drivers, Macron has been successful. But on those issues where opposition to reform maps onto a newly emerging cleavage between liberalism and populism, between the cosmopolitan-liberal-urban so called ‘elite’ and the national-conservative-rural ‘populace’, it has been more problematic. The Gilets Jaunes movement was born initially out of opposition to a tax on fuel among people in the rural hinterlands that depend on their cars for their livelihoods. But it has now morphed into a movement comprising different strands of French society and is supported by both the populist left and populist right. In contrast, the Italian government – especially the Five Star Movement with its base in Southern Italy – is taking an opposite approach to economic policy by promising greater social protection: the preservation of pension entitlements, a citizens’ income for the unemployed, and greater spending on social services. It is doing this even though the Italian government has for decades confronted economic stagnation and high levels of budgetary deficits and debt. Both have become anathema in the EU since the advent of the Fiscal Pact during the Eurozone crisis. As a result, the Italian government has been at loggerheads with the European Commission and Council over its proposed budget, which it had to revise several times to meet the EU’s fiscal sustainability criteria. The EU, because it is a large, cumbersome organisation, has been too slow to develop a common approach and to provide Italy with the material, logistical and financial support it requires. It is something of a contradiction that the Italian government wants the EU to do more to help it solve this problem, whereas in most other areas, it wants it to interfere less. But, despite the EU’s best efforts, this has not been forthcoming. This is something that the Italians – and especially the League – have long been angry about. Along with the disillusionment that Italians feel about membership of the euro, it now effectively forms the basis of popular resentment toward the EU. So the Italian government has refused entry to ships carrying immigrants in Italian ports, shifting the problem to the neighbouring French. The French government, facing its own populist opposition to migration, was also reluctant to step up. On this issue, Macron’s pro-EU credentials are being tested. The only hope lies in the pragmatism that the Commission and Italian government put on display during their discussions over Italy’s 2019 budget. That hope however should be tempered by an appreciation that populism is just as much about style as it is about policy. That style is provocative, confrontational, abrasive, and… popular. Simon Toubeau is an Assistant Professor in the School of Politics and International Relations at the University of Nottingham.